There are a lot of things that bug me about my fellow motorcycle riders. One thing that really gets under my skin is the practice of greeting other riders on the road with the stupid little two-fingered wave. It’s not that I’m antisocial or afraid to take my hands off the bars. It just seems insincere. And lame. Why don’t we wave to cars, for instance? Don’t most of us drive cars, too? And everyone knows you don’t wave to every person on a bike. If you’re like most people you’re selective. You wave to people in your “tribe.” Harley riders wave only to Harley riders. All others confine their greetings to non-Harley riders. Then there are people (like me) who don’t want to wave but feel obligated. I feel guilty when someone waves at me and I blow them off, which I do sometimes. So here’s an idea, one that’s been said by others before me: stop waving. Don’t do it. No mas. Let’s save our mutual admiration for the cantina down the road where we’ll buy each other beers. 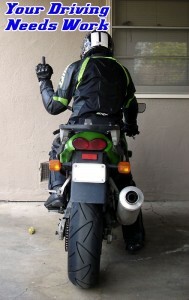 That said, there are some meaningful hand signals that we all should continue to do, especially when riding in groups. You see a road hazard, you point it out for the rider behind you with a hand or foot. Speed trap ahead? Slap the top of your helmet to warn oncoming riders. Turn signal left on? Open and close your fist to the person. And there are many others. Perhaps one of the oldest and most expressive signal is one I’ve been using since junior high. Piss me off enough and I’ll show it to you.